Nothing says Christmas like the scent of a fresh-cut evergreen tree wafting through your city apartment. 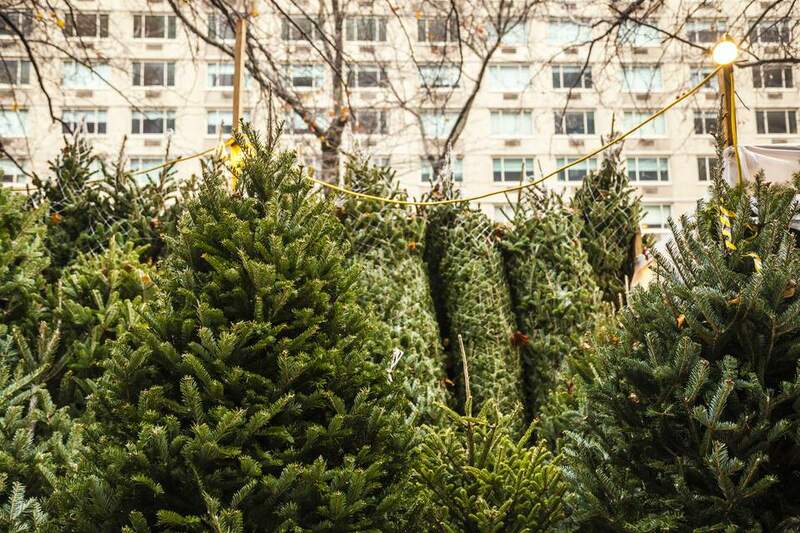 In Manhattan, options for buying a real Christmas tree abound if you know where to look. Here's what you need to know about getting your Christmas tree home for the holidays in NYC, whether you buy it on a street corner or online. Since the 1850s, New York City has been the setting for pop-up tree lots, which seemingly crop up on just about every other block during the holiday season between Thanksgiving and Christmas. These makeshift displays featuring imported evergreens from tree farms as far away as Canada often appear overnight on street corners, in front of shops, or even out of the backs of trucks. There's no standard pricing in place from lot to lot, so your best bet is to be prepared for a little customary haggling and to do some comparison shopping at a few vendors within walking distance of home. Just don't wander too far because the further you end up from home, the further you'll have to schlep your tree back; many of these no-frills vendors don't provide delivery service. There are local New York businesses that offer trees and many will deliver them, decorate them, and remove and recycle the trees too. SoHo Trees has been providing Manhattanites with quality Christmas trees for more than 30 years, specializing in Blue Ridge Frasier Firs. They have seven locations throughout Manhattan, and also offer free stands, free delivery, and online purchasing. For a fee, Soho Trees will decorate any tree with their decorations or even your own. Custom-designed wreaths are also available. And, after the holiday, they offer a tree-removal service. Sustainability-minded NYC Trees has two locations where you can choose your own tree and bring it home yourself—one in Manhattan's Hell's Kitchen area and the other in Astoria, Queens. If you order online, the checkout procedure allows you to select an available date for delivery within a guaranteed three-hour window. Delivery of online orders is free to Manhattan, Queens, Brooklyn, and the Bronx. Deliveries are available to Westchester, New Jersey, Staten Island, and Western Long Island for an additional fee. They also offer wreaths, decorating services, and tree-removal services. Most Whole Foods Markets usually sell Fraser Fir Christmas trees with an option for delivery at NYC locations, but it's a good idea to call ahead to your local market for details. In past years, for every full-size tree sold, the company has made a donation to American Forests, an organization that protects and restores America's forests. The money goes to plant new trees in state and national forests. These days, there's very little you can't buy with just a click of a mouse, and that includes Christmas trees. Enjoy the convenience of picking out your tree online and having it delivered straight to your door. Manhattan-based Tyler's Trees provides Frasier Firs by size from 4-feet tall to 9-feet tall for a set fee in packages that include a tree stand and skirt, delivery, and set-up services on all orders. The Elite service offers trees that are above 9 feet tall and includes personal site visits before delivery to measure the ceiling height and ensure that the tree you ordered will fit in your home. Brooklyn-based Christmas Tree Brooklyn offers free delivery and optional set-up, decoration, and removal services. The easy online checkout procedure allows you to choose the tree, decorations, and services you want, then choose the delivery date and time. You'll receive a text message when the tree is on its way. Bronx-based Egan Acres Tree Farm sells fresh-cut Nova Scotia Balsam Firs and delivers them straight to your door. This family-run operation has been supplying New Yorkers with Christmas trees for more than 55 years. Set-up, lighting, decorating, and removing services are available.